A bunion occurs when the joint at the base of your big toe becomes enlarged, sore and swollen. Your big toe may start to angle toward your second toe, or move underneath it. Women are most affected by bunions, which are often caused by wearing narrow, tight shoes, or high heels. A bunionette occurs on the other side of the foot, near your small toe, and is much smaller than a bunion. A podiatrist can usually diagnose a bunion during a physical exam. 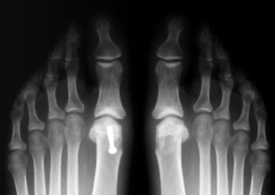 An X-ray may provide further information about the joint, the angle of the toe, and if arthritis or gout are concerns to further investigate. For more information about Bunions or to schedule a consult with Dr. Taormino, call our Ronkonkoma, NY office at Ronkonkoma Office Phone Number 631-467-2813 or our Shirley, NY office at Shirley Office Phone Number 631-281-6882; you may also use our Appointment Request form. Wearing comfortable shoes with a wide toe-box at the first signs of a bunion appearing can decrease its growth and reduce any further complications. Resting the foot, using anti-inflammatory medications, and icing the area may help. In some cases a cortisone shot at the base of the big toe may help. In cases when the bunion is causing severe pain, surgery may be performed to remove the bony bump and to realign the toe. We invite you to read the below reviews from our satisfied patients. Please visit the Patient Review Form page to leave a review about your treatments for bunions with Quality Foot Care. Call our office if you would like more information: Ronkonkoma Office Phone Number 631-467-2813. 5 out of 5 stars based on 4 Bunions reviews. On my first visit Dr. Taormino and staff were extremely informative and welcoming. Definitely lrecommend! What a great place to go for your feet. The doctor happily took the time to fully explain things and cared to educate me on my issues. His staff is really nice and very down to earth which is so important to patients. The Dr. Gave me many options and even suggested to get a second opinion if I wanted to. Great, trusting and I'm going to bring my 12 year old daughter to him for help with her issue. Totally recommend this office! !